Communications satellite company Inmarsat has received the all clear from UK telecoms regulator Ofcom to build ground based stations. 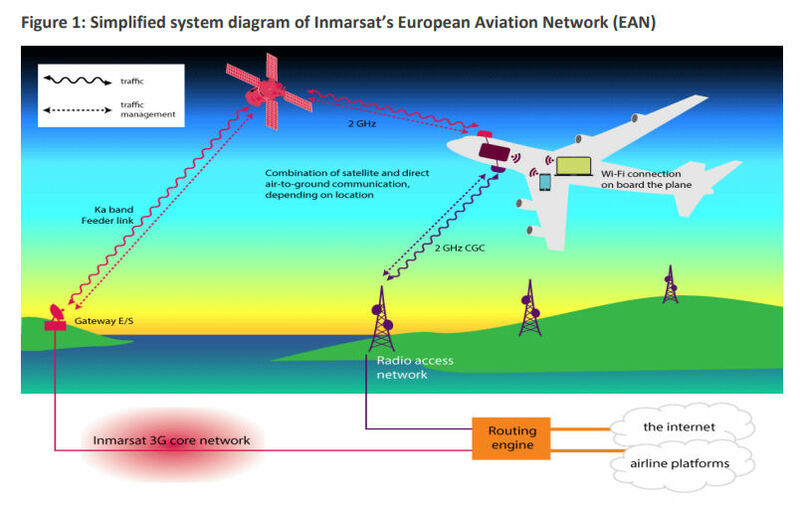 This seems to have been a necessary extra permission needed for Inmarsat to include the UK in its European Aviation Network, on top of the license to provide mobile satellite services over the 2 GHz frequency band, which was granted by both the European Commission and Ofcom back in 2009. The need for CGCs (complementary ground components) is illustrated below by a diagram taken from Ofcom’s official document on the matter. The use of the 2 GHz license for aeronautical, as opposed to terrestrial, coverage is contentious. Inmarsat competitor ViaSat, which presumably doesn’t hold such a license, is especially unhappy about it, arguing that the aeronautical use-case wasn’t on the table when the band was auctioned. The implication is that ViaSat would have had more of a go at getting some 2 GHz action if it had known this would be allowed. We have some sympathy with ViaSat if that is how the auction process played out. Regulation can have a very profound influence on the fortunes of a telco and if in-flight connectivity turns out to be a big deal then those excluded from it are entitled to feel hardly done by. But with regional regulators like Ofcom giving it the all-clear it seems to be a done deal.